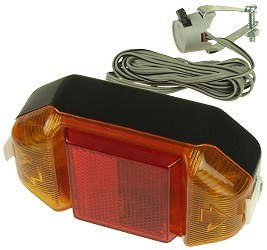 Browse for turn signals by vehicle make and model. 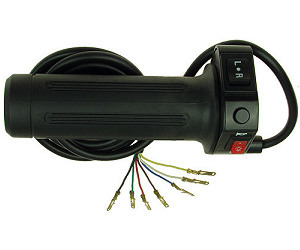 Turn signal with 12 Volt 5 Watt bulb. 3" wide x 3-1/2" long with 1-1/2" round amber plastic lens. 8" long power cable leads. Chrome plated plastic body with rubber shock isolator and 3/8" OD nickel plated steel mounting post and nut. 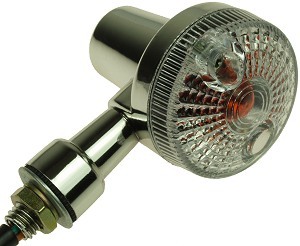 Turn signal with 24 Volt 5 Watt bulb. 3" wide x 3-1/2" long with 1-1/2" round amber plastic lens. 8" long power cable leads. Chrome plated plastic body with rubber shock isolator and 3/8" OD nickel plated steel mounting post and nut. 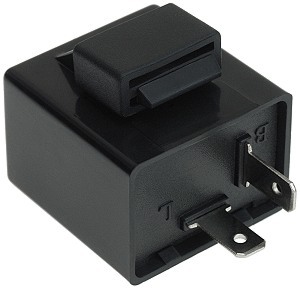 Turn signal with 40 Volt (36V) 5 Watt bulb for 36 Volt electric scooters and bikes. 3" wide x 3-1/2" long with 1-1/2" round amber plastic lens. 8" long power cable leads. Chrome plated plastic body with rubber shock isolator and 3/8" OD nickel plated steel mounting post and nut. 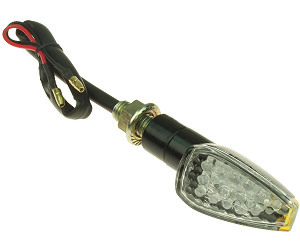 Turn signal with 56 Volt (48V) 5 Watt bulb for 48 Volt electric scooters and bikes with 48 Volt lighting systems (some 48 Volt vehicles have 12 Volt lighting systems). 3" wide x 3-1/2" long with 1-1/2" round amber plastic lens. 8" long power cable leads. Chrome plated plastic body with rubber shock isolator and 3/8" OD nickel plated steel mounting post and nut. 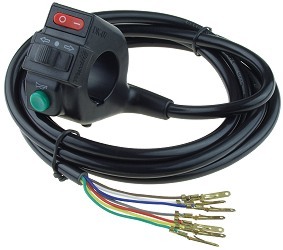 Turn signal with 12 Volt 3 Watt bulb. 2-1/2" wide x 3" long with 1-3/4" round amber plastic lens. 10" long power cable leads. Chrome plated plastic body with 3/8" OD nickel plated steel mounting post and nut. 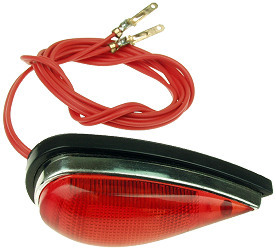 Turn signal with 24 Volt 3 Watt bulb. 2-1/2" wide x 3" long with 1-3/4" round amber plastic lens. 10" long power cable leads. Chrome plated plastic body with 3/8" OD nickel plated steel mounting post and nut. 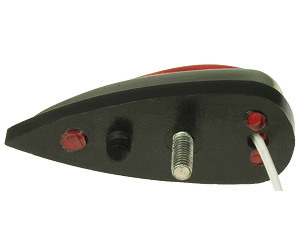 Turn signal with 40 Volt (36V) 3 Watt bulb for 36 Volt electric scooters and bikes. 2-1/2" wide x 3" long with 1-3/4" round amber plastic lens. 10" long power cable leads. Chrome plated plastic body with 3/8" OD nickel plated steel mounting post and nut. 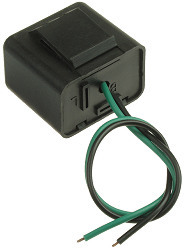 Turn signal with 55 Volt (48V) 3 Watt bulb for 48 Volt electric scooters and bikes with 48 Volt lighting systems (some 48 Volt vehicles have 12 Volt lighting systems). 2-1/2" wide x 3" long with 1-3/4" round amber plastic lens. 10" long power cable leads. Chrome plated plastic body with 3/8" OD nickel plated steel mounting post and nut. 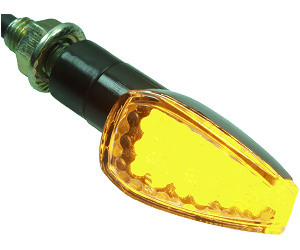 Turn signal with 12 Volt 3 Watt amber color bulb. 2-1/2" wide x 3" long with 1-3/4" round clear plastic lens. 10" long power cable leads. Chrome plated plastic body with 3/8" OD nickel plated steel mounting post and nut. 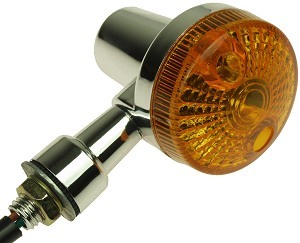 Turn signal with 24 Volt 3 Watt amber color bulb. 2-1/2" wide x 3" long with 1-3/4" round clear plastic lens. 10" long power cable leads. Chrome plated plastic body with 3/8" OD nickel plated steel mounting post and nut. 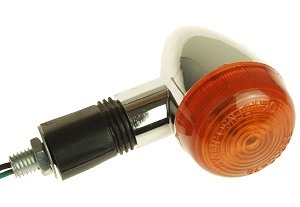 Turn signal with 40 Volt (36V) 3 Watt amber color bulb for 36 Volt electric scooters and bikes. 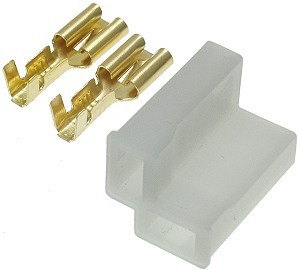 2-1/2" wide x 3" long with 1-3/4" round clear plastic lens. 10" long power cable leads. Chrome plated plastic body with 3/8" OD nickel plated steel mounting post and nut. 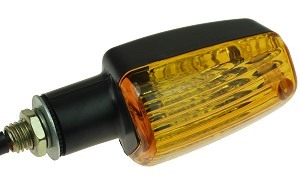 Turn signal with 55 Volt (48V) 3 Watt amber color bulb for 48 Volt electric scooters and bikes with 48 Volt lighting systems (some 48 Volt vehicles have 12 Volt lighting systems). 2-1/2" wide x 3" long with 1-3/4" round clear plastic lens. 10" long power cable leads. Chrome plated plastic body with 3/8" OD nickel plated steel mounting post and nut. 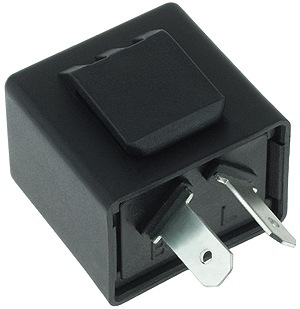 Turn signal with 12 Volt 3 Watt bulb. 1-1/4" wide x 3" long with a 2" x 1-1/4" amber plastic lens. 10" long power cable leads. Black plastic body with 3/8" OD nickel plated steel mounting post and nut. 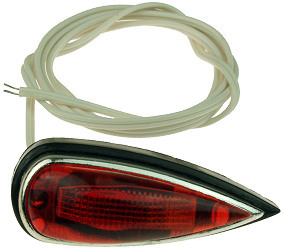 Turn signal with 24 Volt 3 Watt bulb. 1-1/4" wide x 3" long with a 2" x 1-1/4" amber plastic lens. 10" long power cable leads. Black plastic body with 3/8" OD nickel plated steel mounting post and nut. 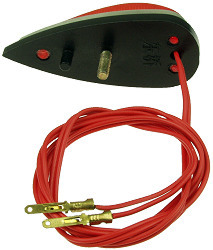 Turn signal with 40 Volt (36V) 3 Watt bulb. 1-1/4" wide x 3" long with a 2" x 1-1/4" amber plastic lens. 10" long power cable leads. Black plastic body with 3/8" OD nickel plated steel mounting post and nut. Turn signal with 55 Volt (48V) 3 Watt bulb. 1-1/4" wide x 3" long with a 2" x 1-1/4" amber plastic lens. 10" long power cable leads. Black plastic body with 3/8" OD nickel plated steel mounting post and nut. Turn signal with 14 amber LED bulbs. 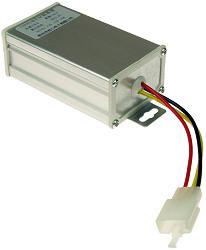 Runs on 12 Volts DC. 1-1/8" wide x 3-1/2" long with 1-1/16" x 1-7/8" triangular shaped clear plastic lens with amber tip. 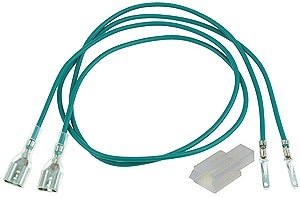 10" long power leads with bullet connectors. 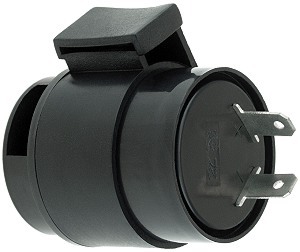 Black plastic body with 3/8" OD cadmium plated steel mounting post and nut. 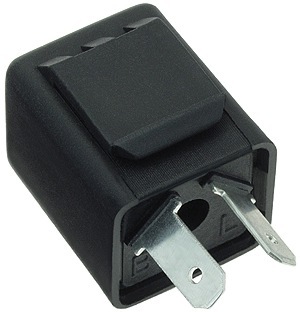 12 Volt 3 Watt bulb. 2" wide x 3/4" high base with a 1-5/8" x 1/2" teardrop shaped red plastic lens. Rear facing mounting bolt. 26" long power cable leads. 24 Volt 3 Watt bulb. 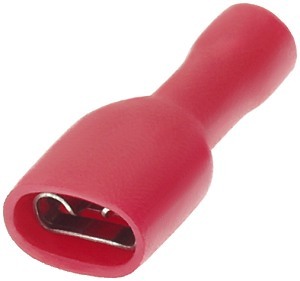 2" wide x 3/4" high base with a 1-5/8" x 1/2" teardrop shaped red plastic lens. Rear facing mounting bolt. 26" long power cable leads. 24 Volt 3 Watt bulb. 2-1/2" wide x 1" high base with a 2-1/4" x 3/4" teardrop shaped red plastic lens. Rear facing mounting bolt. 19" long power cable leads. 36 Volt 3 Watt bulb. 2-1/2" wide x 1" high base with a 2-1/4" x 3/4" teardrop shaped red plastic lens. Rear facing mounting bolt. 19" long power cable leads. Set of two black anodized CNC machined billet aluminum handlebar end lights. 240° wide viewing angle. 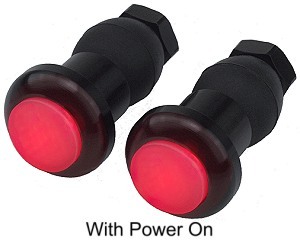 Each light has two super bright red LED lights inside of it with a translucent silicone lens. Press the lens once for flashing red light, twice for continuous red light, and a third time to turn the light off. 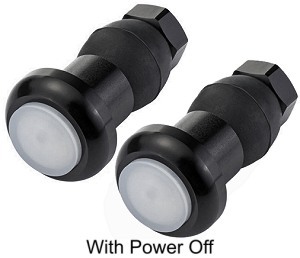 Both lights can be turned on at the same time as safety lights or they can be individually turned on and off as needed for turn signals. Fits virtually all electric scooter and bike handlebars. Minimum handlebar ID that they will fit is 16mm and maximum is 23mm. The aluminum bezel unthreads from the aluminum base for easy battery replacement. 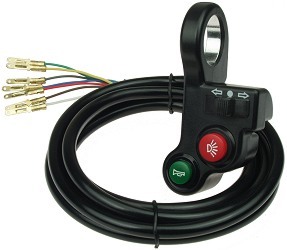 Each handlebar end light uses two AG10 batteries (batteries are included).